For eBay, it's about more than just getting likes on Facebook. The e-commerce giant is going all-in on social, including some platforms you probably haven't heard of. E-commerce giant eBay (EBAY - Get Report) prides itself on being active and innovative across 15 different social channels. Just this past week, the company announced that it was partnering with Facebook (FB - Get Report) to roll out a chatbot on Messenger. But eBay doesn't just settle for the obvious platforms; it goes for the niche ones, too. 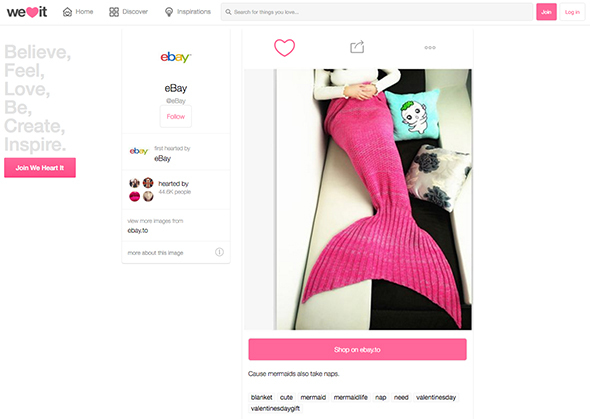 Among the channels eBay is active in are Imgur, Kik, Stumble Upon, and We Heart It. The average investor may not have even heard of these platforms, but for eBay, they are key drivers of customer acquisition and brand building. We sat down with eBay's Head of Global Growth, Jody Ford, to learn more about how he's making social a central part of eBay's growth strategy. TheStreet: How does social media fit into eBay's larger strategy? Jody Ford: Over the last few years, we've been driving global marketing. The purpose is to communicate with customers off eBay and find new users and provide them with great personalized experiences. Social, which is one of our priority areas within the organization, is a massive opportunity. Nearly half of all millennials use social in their shopping journey. Customers are spending 40 minutes or more on social media per day. We have to be there, and we see competitive advantage by being the first to be there. Ten percent of our marketing traffic in the U.S. is coming from social. That traffic has doubled in the last two years. That gives you a sense of how significant it is. We continue to see it as an important investment. It's where our customers our going. TheStreet: What's the benefit of being active on so many different social networks? Ford: Social channels like Kik and Stumble Upon allow us to go after a clear demographic. Pinterest is maybe great for middle-aged women, while Imgur is great for millennial men. It allows you to go and have a clear message. You hear about these sites and then find out that maybe over a 100 million people are there, and that makes it exciting. That's the diversity in the model we're building out. The opportunity is to access new customers and to present eBay in a new way to them and be relevant to their world. The press puts lot of attention on Pinterest and Twitter and Facebook and YouTube. But the other sites we're engaging with are the untold stories of social [media]. TheStreet: Do you have any general best practices for social media? Ford: When you're on a social channel, you have to have something to say and something of value to the user. You've got to engage them early in their shopping journey or relate to something they care about. We're trying to tap into some need, and we do that with the verticals where users are passionate. Because of our data, we can look at what's trending on eBay and really see the things almost before they're happening out there. Customers love to hear about things that are trending or hot. We can package that data in a way that's interesting for users. TheStreet: How do you create all of the content you post on social media networks? Ford: We fill up a really strong list of premium publishers and influencers who are individuals who create content for us. Like Thrillist -- they're great at producing content that resonates with the target user. Buzzfeed and Crowdtap, too. We use the publishers to create that content. We take it, host it on eBay, and push it out to channels. TheStreet: What are some of the less well-known sites that work well for eBay? Ford: Imgur is a massive site. There are 150 million monthly active users on Imgur, which is gigantic. It's this subcommunity people don't talk about, and I think this will emerge next year. It's not mass market -- it's large, but focused on millennial males. The challenge for an advertiser is how do you show up in a site that has such a strong culture in an authentic way? We work with Imgur and are among the first brands that do promoted posts. We worked with them to develop these posts that have been spectacularly powerful. People are beginning to look forward to them, which is exactly where we want to be. TheStreet: Any other lesser-known sites? Ford: We Heart It -- I wasn't familiar with this a few months ago, but it's got over 140 million users globally. When you read about it and understand what it is, it's a place where females show up to be themselves and have honest conversations and talk about what's on their mind. We're working closely with We Heart It. [A story about] drones would not work for this crowd. It's about showing up in the right way with the right voice. This mermaid tail post generated 40,000 visits to the site. TheStreet: Are you noticing any new trends in social advertising? Ford: There's this explosion of messaging sites. Whether it be Snapchat or Messenger or Kik, they again frame a really interesting question for marketeers of how should we be present? Social sites are great, but people are spending lots of time on messaging sites, so you've got to work out how to turn up there. Kik is another huge site that is really growing. People obsess about Messenger and Snapchat, and Snapchat captured the nation, but Kik's massive. TheStreet: Which channels tend to have better results for eBay? Ford: Anecdotally, Pinterest and Facebook are the at-scale channels that are working really well for us. Pinterest is growing really fast, and we like that. We've got some of the top engaged pins on Pinterest. 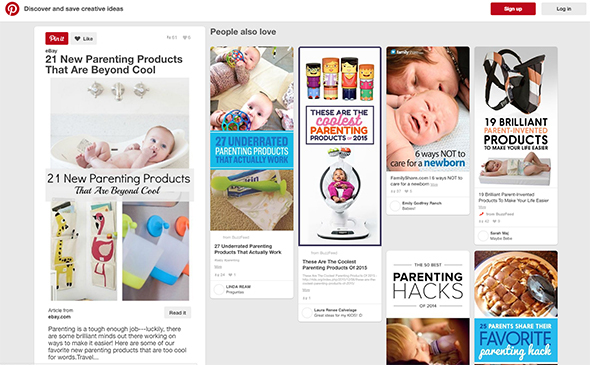 We have a natural resonance with the Pinterest community.